So what's the 'Big Deal' about ISRAEL? "Blow the ram's horn trumpet in Zion! Trumpet the alarm on my holy mountain! Shake the country up! God’s Judgment's on its way--the Day's almost here!" Joel 2:1 (MSG) In the course of studying the Bible and watching the current events unfolding right before our eyes it became clear that God is doing something awesome in our generation. It began with personal search through the Bible to see for ourselves if God’s Word clarified itself to God’s love and plan for Israel and the Jews up to the point of the return of the Bride of Christ. We just had to be able to understand the times in which we live and invite you to do the same. The message might seem elemental to some of you and it may puzzle some of you too! Questions are often asked, for which we do our best to reply to individually. One person recently said that he had no idea whatsoever what all the big deal is about Israel, as, since the coming of the Messiah Yeshua (Jesus), "there is neither Jew nor Greek, slave nor free, male or female" sees Gal 3:28. Further, he maintains that Romans 2: 28-29 says that all who believe and are circumcised of heart and are, therefore, "the real Jews." This, to us, is indeed sad. While the Lord loves each of us dearly, He has gone through much effort in His Word to teach us that Israel has, does, and will continue to play a major role in shaping world events; He has ordained it to be that way! Thus by belittling the role of Israel and the Jewish people, to us demonstrates the "toll" being taken on the minds and hearts of Christians by teachers who have taken Scriptures out of their intended context. Doing so often makes a perversion of the truth. And it only takes a little bending of the truth to create a lie. Just as it should be obvious to these people (despite their good intentions) that there ARE still "male and female," there certainly still are Jews and Gentiles ("Greeks") in the world today. Being saved did not "change our religion" from Jewish to Christian. After all, Jesus was Jewish when He walked this earth wasn't He? His establishing the "Kingdom of God" on earth, among men, didn't change Him from a Jew to a Christian, did it? And, we certainly believe the people to whom Paul was referring in Romans 2: 28-29 as the "true Jews" are those Jews who are truly circumcised in their hearts. These verses must be read and understood in their intended context. Paul obviously knew many Jews who were not circumcised of heart, only the flesh. Jeremiah knew them, too (see Jeremiah 9: 26 (b). Since the Lord is "no respecter of persons" Romans 2:11, He loves each of us equally. But Scripture nowhere indicates that the Lord is through with the Jewish people. In fact, He has specific and different end-times plans for Jews than He does for Gentiles. Though we, as believers, are one in Jesus (Yeshua), we still have our discrete functions, just like there are different parts and functions of the body. A close review of prophetic Scripture shows us this, clearly. The "big deal" about Israel is that many prophecies pertaining to these last days apply to this physical land and people of Israel. The Lord is coming back to Jerusalem, not to Johannesburg, not to New York or Sydney. He will rule and reign from Jerusalem, not London. salvation" (Isaiah 45:17) anyway! No amount of fancy footwork on the part of church "re-writers" of Scripture can change that. There is a not-so-subtle spirit already well-ingrained in the church, which is trying hard to move Israel out of its critical position in the sphere of end-times, in fact advocating that either they (the Church) replace Israel (being "spiritual Jews") or, they see Israel as Scripturally irrelevant altogether. 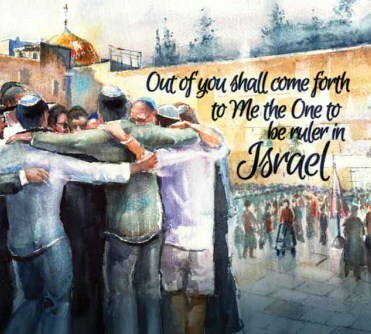 They have taken many Scriptures and have tried hard to formulate a "spiritualized" meaning for them, thus "neatly" eliminating the nation Israel from any connection to the prophecies of the Old and New Testaments. Perhaps they do this because they are ignorant, or perhaps they harbour anti-Semitic feelings or perhaps they are jealous of Israel. Zech 8:23, "Thus says Yahweh of Armies: "In those days, ten men will take hold, out of all the languages of the nations (gentiles), they will take hold of the skirt of him who is a Jew, saying, 'We will go with you, for we have heard that God is with you.'" Even though the nation of Israel still has its problems in various ways and some are very religious. But the Lord loves Israel with an "unquenchable love" and an "everlasting with "an everlasting salvation" Isaiah 47:17; Romans 11:26 and, as Romans 11 teaches, they "are beloved for the sake of the Fathers" (V 28). Because of the promises to Abraham, nothing can separate them (or US!) from the love of the Father! Israel's salvation is NOT based on their present-day faithfulness to God. Israel (and the Jewish people wherever they are located) is as stubborn, stiff-necked and lost as anyone without Messiah. Many churches are sadly ignorant of any Old Testament teaching, preferring to think of themselves as "New Testament Christians! "My people perish for lack of knowledge…" Hosea 4:6 (a). They believe that they have "appropriated this position by faith," just as Jacob obtained the birthright that was rightfully Esau's because Esau was foolish and unfaithful. The name Jacob means "sup planter" that is, one who, through tricks and deception, takes the place of another (Genesis 25: 26-27; 36). Is this the proper strategy for the church? Is this the way the God we serve operates? Most certainly not! Pastors who teach this "Replacement Theology" are blocking great riches from their flocks! What are "the ancient paths...?" In Biblical times, traders and merchants of all sorts travelled from country to country and between cities via paths that they and their ancestors had travelled for centuries. Spices came from Ethiopia and India to Babylon (see also Genesis 37:25). Fine silks came from Persia by travelling merchants who walked upon ancient, well-proven, paths. But one could also take a "short-cut," off the ancient path, through a wilderness area perhaps, to try to save some travelling time and distance. Even sailors had established sailing "paths." But to stray off the "ancient", well-proven path meant taking a great risk. Wild beasts could more likely be found in areas less travelled. Thieves and marauders would await someone to stray into their area, off-the-beaten-path, where they would then become easy prey for the unscrupulous. The point is that when Scriptures are selectively used so that other Scriptures are ignored which would bring balance to the statement "the ancient path" is left behind. People get mislead, confused and, often can stumble. In our opinion, the subject of "standing with Jews and Israel" when the "lights go out," will be the most significant issue a Christian living in any age could face. We believe it will also be the mechanism whereby the Lord judges the nations. One cannot accept Jesus and reject Israel. It's a package deal! (Matthew 25: 31-46) He will draw all nations against Israel so that He can begin the judging process Zechariah 12:2 and 14:2. All this may seem "old hat" or irrelevant to some of you. But, if this is God's truth, we had better understand what the unfolding plans of the Lord are: "And now many nations have been assembled against you [Israel] who say: 'Let her be polluted, and let our eyes gloat over Zion.' But they do not know the thoughts of the Lord and they do not understand His purpose; for He has gathered them [the nations] like sheaves to the threshing floor. 'Arise and thresh, daughter of Zion, for your horn I will make iron and your hoofs I will make bronze, that you may pulverize many peoples, that you may devote to the Lord their unjust gain and their wealth to the Lord of all the earth" Micah 4:11-13. Study Micah 5: 4-15 – (read 'Assyrian' as 'enemy,' as this is a Millennial passage, Assyria representing Israel's enemies); also, see Zechariah 9: 11-17. One simply cannot curse what God has Blessed! Isaiah 40:1-2 "Give comfort, give comfort, to my people, says your God. Say kind words to the heart of Jerusalem, crying out to her that her time of trouble is ended, that her punishment is complete; that she has been rewarded by the Lord's hand twice over for all her sins." Calling the church Israel; excluding literal-Israel from any relevance to end-times prophecy; failure to recognize that the Jewish people form the vital link by which the church has been grafted-in, are all forms of cursing Israel. Jesus taught the Gentile woman: "Salvation is from the Jews" John 4:22. "Replacement Theology," teaches the replacement of Israel with the Church. It is a subtle (and therefore very deceptive) theology which leaves any mention of, or prayer for literal Israel out of its doctrine. Many churches unknowingly already practice this teaching. When they read the words "Zion" or "Israel," they immediately spiritualize it to mean "the church." This contradicts the character and revealed will of God. To be deprived of the rightful blessing of God, is a curse. Balaam tried to curse Israel but could not because the Spirit of God had come upon him (Numbers 24: 1-9). "Lord, I read what You have told me through Your Word, as well as through others who teach by Your anointing and through the inward witness of Your Holy Spirit, that You are faithful to Your promises for all eternity. Because You Lord are faithful to Israel, I also know that You will never leave me or forsake me, either. Lord, I stand with Israel, to pray and intercede for her because she walks without the knowledge of her Messiah Jesus and her recognition of Him will be "life from the dead," and because You stand with Israel. You are her sword and shield Psalms. 84:11; 89:18; 115:9 and mine also, because we are grafted together Romans 11: 17-24. I seek to be a blessing to Israel, not to replace or slander her, and I know You will bless me for it Genesis 12:3. Thank You for revealing this mystery to me "lest I be wise in my own conceits" Romans 11:2. In Jesus’ (Yeshua)’s Name, Amen." He also said that the moon is a witness of this covenant. When you walk out at night and see the moon shining in the heavens, you see God’s eternal witness speaking to all men in all languages that His covenant with Israel is forever and unconditional. In the Old Testament, there were 3 kinds of covenants; a shoe covenant, a salt covenant, and a blood covenant (which is the most solemn and binding of the (3). And that God’s covenant with Israel is a blood covenant? In Genesis 15 God commanded Abraham to take a heifer, a female goat, a ram, a turtledove, and a pigeon. All were split in half except the birds. Because no man can look upon God and live, God placed Abraham in a deep sleep as He prepared to enter a blood covenant with him. In his sleep, Abraham saw a smoking oven and a burning torch that passed between those pieces" of the slain animals (vs. 17). In the Old Testament, the burning lamp signified the presence of the Shekinah Glory of God. God was binding Himself by blood covenant to Abraham and his descendants forever, saying, "To your descendants I have given this land." Never did God suggest the covenant was conditional. Exactly the opposite is true; this covenant depends only on the faithfulness of God, and He is ever faithful. Psalm 89: 34-37 confirms this unconditional promise. God said; "I will not break My covenant, nor change the thing that has gone out of My lips. Once I have sworn by My holiness that I will not lie to David. His seed shall endure forever, and his throne as the sun before Me. It shall be established forever like the moon, and like a faithful witness in the heavens." Selah. God clearly said He will not break covenant with Israel, David’s sons, even though Israel disobeys Him! Psalm 83: (We have separated the verses!) " O God, do not keep silent; do not be still, do not be quiet! Look! Your enemies are in revolt, and those who hate you are rebelling. They are making secret plans against your people; they are plotting against those you protect. "Come," they say, "let us destroy their nation, so that Israel will be forgotten forever." Scatter them like dust, O God, like straw blown away by the wind. As fire burns the forest, as flames set the hills on fire, chase them away with your storm and terrify them with your fierce winds. Cover their faces with shame, O LORD, and make them acknowledge your power. May they be defeated and terrified forever; may they die in complete disgrace. May they know that you alone are the LORD, supreme ruler over all the earth! As Christians, we are all called to support The Nation of Israel. In Genesis 12:3, the Lord promises to "bless those who bless you (Israel), and whoever curses you I will curse," Psalm 122 instructs us to "pray for the peace of Jerusalem!" At this crucial time in history, believers will be blessed for standing with, supporting and praying for Israel.